Lured by the prospect of a free box of 12 doughnuts each week for a year, 24-year-old English teacher Yroll Desamparado waited 22 hours outside Phnom Penh’s first Krispy Kreme doughnut store over the weekend, ahead of its grand opening on Sunday. “It took patience, strength and endurance” he said on Sunday morning, wearing an orange “#1” wristband as he waited for the doors to open at 10 a.m. The doughnut giant, and latest U.S. fast-food chain to come to Cambodia, announced the competition on its Facebook page on Wednesday, with second and third place finishers getting six months and three months of weekly free doughnuts, respectively. “I arrived at 7 a.m. yesterday. I really wanted the doughnuts,” Mr. Desamparado said outside the shop on the corner of streets 302 and 51 in Boeng Keng Kang I, just a few doors down from long-standing USA Donut and another competitor, Big Apple Donuts & Coffee. Having tasted Krispy Kreme for the first time in his native Philippines last year, Mr. Desamparado said that the possibility of a free year’s supply was worth sacrificing his weekend for. The initial wait was lonely, however, with the next person joining the line at 3 p.m.
“When I heard there was a crazy person already in line, I jumped on my moto,” explained Sam Sothy, 34, manager of the nearby Tokyo Barber Shop, and the second-prize winner. She said she would be sharing her 6-month supply of doughnuts with her staff, a gesture that Krispy Kreme recommends. “Our brand is about sharing treats with others,” Martin Leclercq, business development manager of Krispy Kreme, said earlier this month, admitting that the company’s core product was not particularly healthy. “We expect people to make choices in accordance with their lifestyle,” he said. For Mr. Desamparado, however, sharing his prize was not part of the plan. “Of course, I will eat them all myself,” he said. By the time the doors opened shortly after 10 a.m. on Sunday morning, over 250 people—mostly Cambodians—had lined up around the block. Some were still waiting to claim their sugary prizes an hour later. Most famous for its glazed ring doughnut, which retails for $1 each and contains about 190 calories, Krispy Kreme also sells a range of flavored options for $1.25, including a regional mango variety. 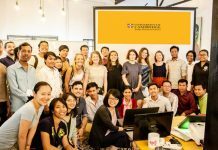 The company has announced plans to open 10 stores throughout Cambodia over the next five years. 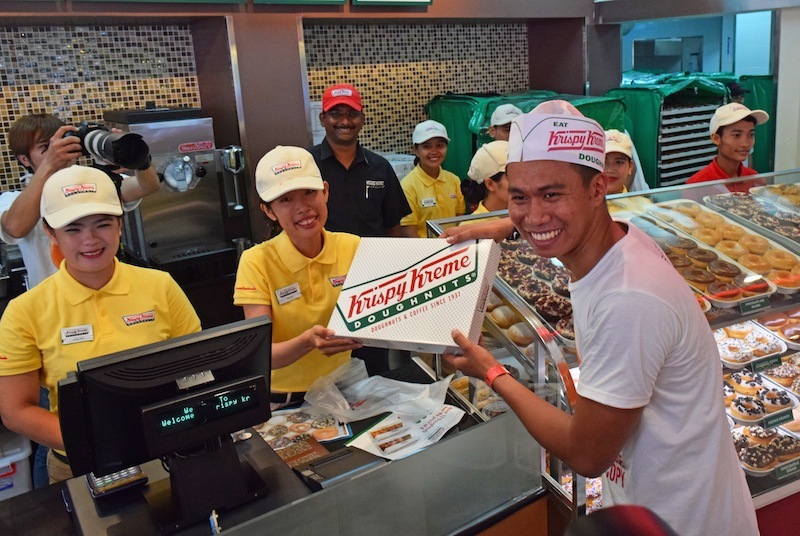 Steve Avery, senior director of Krispy Kreme’s international department, based in Bangkok, said that with the brand pushing into Asian markets—it opened its first store in Bangladesh last week—Cambodia was a natural expansion. 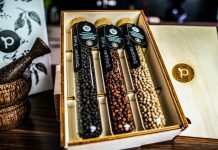 “We would love to cater for the sweet treat fix of every country,” he said.